Chief Minister Sarbananda Sonowal launched the beginning of a survey work for Brahmaputra Express Highway from Sadiya to Dhubri at a function held at Dibrugarh on Tuesday. 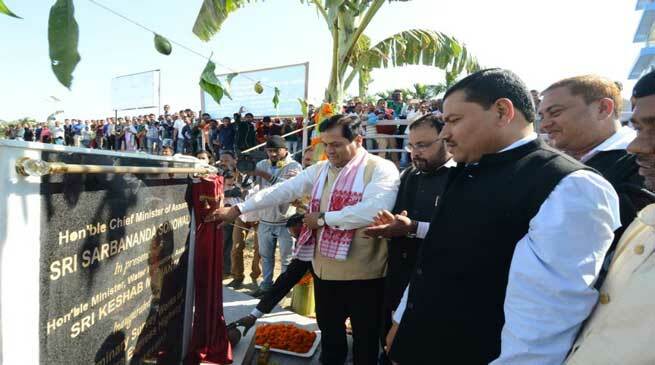 Inaugurating the scheme Sonowal said that the Government of Assam has taken up several steps to develop both the banks of the mighty Brahmaputra and Brahmaputra Express Highway is a step forward in this regard. Already three round of discussions were held with World Bank, Asian Development Bank and Ambassadors visiting from different countries to use modern technology for taming Brahmaputra and to tap its resources to help hydro and agri growth in Assam. He said that World Bank gave its positive nod for the same. He also stated that the Union Minister for Road Transport, Highways and Shipping Nitin Gadkari for the first time conceived of a concept of an Express Highway on both the banks which could be constructed by utilising the silt to be dredged out from the river bed in a meeting held in New Delhi in the month of October 2016. He also distributed engagement letters to 16 groups today for carrying out survey of the project. Sonowal also advocated for long term planning for utilising the Brahmaputra’s hydrology and other related resources so that an important tourist destination is developed surrounding Brahmaputra. He also emphasised the need for using modern technology for the same.